Now, open the Sikuli IDE. We begin by taking the screenshot of our target, the Start menu symbol that is usually located in the lower-left corner of the desktop. Using this screenshot, we can tell Sikuli script what to click on. To simulate a mouse click on the Start symbol, we are going to use the click function. To tell Sikuli how the Start symbol look like, we need to capture its image on teh screen. The second method is to press a hot-key (Ctrl + Shift + 2). Often the target whose image you wish to capture may be covered by the Sikuli IDE’s window. 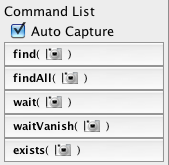 You can minimize the IDE’s window and use this hot-key to switch to the capturing mode. In the screen capturing mode, the screen will look darker and freeze momentarily. The entire desktop becomes like a canvas where you can draw a rectangle around the target you want to capture an image of. In this case, the target is the Start symbol. The cross of red dotted lines shows the center of the rectangle you just drew. Now, you can write the click function using this image as an argument to tell Sikuli to click on start symbol. The next step is to tell Sikuli to enter the string “Hello World” into search box, which can be done with a simple type function. This function will type the string given in the argument into whichever input control that has the focus. After clicking on the Start symbol, we can expect the search box will be the input that has the focus.